In-Ear Monitoring has long been used to reduce sound levels on stage and allow musicians to focus on what they want and need to hear. KLANG:technologies’ advanced 3D mixing system takes this to a whole new level. Unlike stereo, which creates an unnatural soundstage inside your head, the KLANG 3D image surrounds you naturally. Instruments can be placed in their actual location, but at a sound level to suit the musician. This natural and intuitive placement of sound, with pristine sonic quality, lets musicians focus on their art – not on their monitor sound. And best of all, KLANG’s 3D mixing products work with existing standard in-ear monitors. The transparent quality and the true placement of sound suits every genre of music, from classical to rock, and the system’s ease of use and scalability makes it ideal for any size of performance. 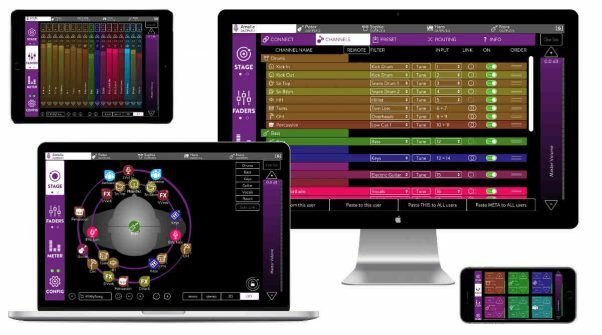 Operated from KLANG:app, an intuitive visual interface, every musician can hear exactly what they want, at the level they need to hear it. As sounds merge rather than conflict, nothing needs to be turned up to be heard and lower levels are required, which reduces ear fatigue. The hearing of sounds is perceived very similarly to an acoustic session, but within the controlled environment of In-Ear Monitoring. Localisation enables the brain’s natural capability to sort and prioritize audio within the mix, providing transparency – known as the Cocktail Party Effect. Headquartered in Aachen, Germany, KLANG:technologies is the world’s first manufacturer of truly immersive 3D in-ear monitor mixing technologies. The company’s core product, KLANG:fabrik, is an award winning professional personal monitor mixing solution that combines the latest Binaural research with intuitive controls to offer the best in-ear monitoring solution out there. With plenty of flexible audio interfaces (i.e. MADI, Dante, and ADAT) it incorporates with everything from pro-grade mixing boards to nearly every kind of stage setup. 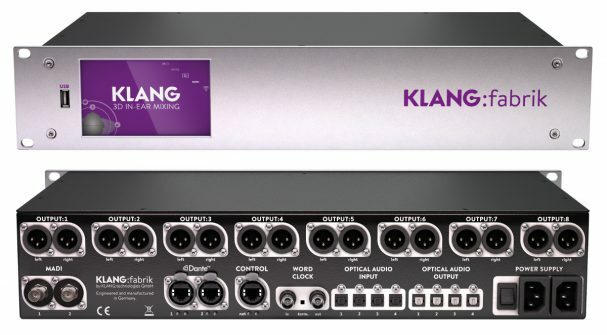 The KLANG system is simply scaled with I/O daisy chain units and is easily used by musicians, monitor engineers, or both working hand in hand. KLANG adds extra dimension to Jeff Wayne’s The War of the Worlds spectacular. Pensacola-area church worship leader, singers and band rely on KLANG’s 3D IEM mixing system. HOW chooses 3D IEM mixing system for its newly-opened Frisco East broadcast campus.